I was just a little too Japanese. As in whenever I left my Japanese at home. It would make me feel alright. But I didn’t sound like the others. My teacher said that my sentences sounded funny. I woulda left the room but it wasn’t right. I was a model minority student. Because that was the only homework that my mother could help me with. The numbers just didn’t add up. The Yonsei kid was laughing at me. If I subtracted the accent we were the same underneath. My father told me that I am more than the sum of my parts. The Yonsei told me that I was fresh off a boat. So I resisted the urge to speak. So make sure you mind lands. On the point of our pens. Shouldn’t have been a mark of loyalty. Shouldn’t have been the narrative of American. Shouldn’t have divided our families. Generations later we still try to do the math. So we subtracted the parts of that made us other. Resisting while being a citizen, Japanese and American. Resisters, the senate silenced our voices. Then they came for the loyal. Then they came for the people who were bound to no native soil. Where we set up the resistance. There’s still redress to be served. My grandfather collected years waiting for his father at Crystal City, Texas. We collected your stories today. We are the 442nd and the Resisters of today. My grandfather would have had his 82th birthday. His father promised him the biggest gift that he could buy. His father was the line of the divide sign. Walking the rope between two nations. It’s a shame that he was born on February 19th. On his birthday we received an executive order in place of his father. 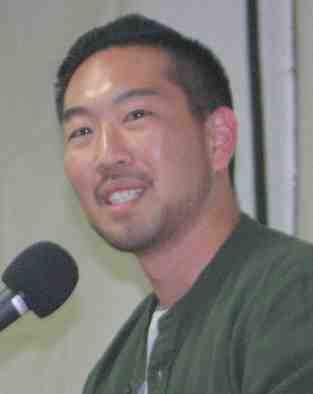 Kurt Ikeda is a Hawaii-born, Gardena-raised Shin-Nisei who is an educator by profession, a poet by passion. He serves the McArthur Park community as a high school English teacher but got his start as a teaching assistant for kindergarten at the Gardena Valley Japanese Cultural Institute’s Japanese Language School. He preaches social justice to his poetry students and puts it into practice as board secretary of the JACL Pacific Southwest District and co-president of the Greater Los Angeles Chapter. This spoken-word piece was performed during this year’s Day of Remembrance program at the GVJCI.